Emigrant Wilderness is one of the most popular places for Northern California groups to complete a 50 mile backpacking trip. There are so many trailheads, lakes, and worthwhile routes, that it would be impossible to name them all. You can enter Emigrant from Yosemite (Boundary Lake), Hwy 108 (Crabtree, Gianelli Cabin, and Kennedy Meadows), or the Sonora Pass (Leavitt Peak). Permits are easily acquired at any of the Ranger Stations and up to 15 backpackers can be accommodated on a trek. Bear cans are not required. A fantastic 2002 trip took us from Crabtree to Hyatt Lake , past Big Lake to the East Fork of Cherry Creek (mostly bushwhacking all afternoon but a fantastic campsite on the Creek), to Wood Lake (mosquito swarms at Cow Meados), to Relief Valley (encountered drovers with lots of cows), to Brown Bear Pass, to Latopie Lake (beautiful and surrounded by snow), and out at Sonora Pass. With the exception of an adult with a bad attitude, getting lost and adding five miles one afternoon, having to cross a raging stream by walking over a fallen log 30 feet above the raging water, and getting into Hyatt Lake well after dark on the first day, it was an unremarkable experience! Our 2008 hike was from Gianelli’s Cabin to Whiteside Meadow to Emigrant Lake to Snow and Bigelow Lakes to Lertora Lake to Gem Lake. Very straightforward and enjoyable. Every camp was in a beautiful setting. Remember that the mosquitoes are bad in July and just about any place called a “Meadow” is full of them. Lertora Lake is a great place to swim and camp (one of my favorite places in Emigrant.) There are always lots of day hikers near Crabtree and Gem Lake is a popular destination for them. If you bushwack from Snow Lake to Bigelow Lake (some maps show a trail be we couldn’t follow it all the way over the saddle) remember to stay high. Do not descend into the valley or you will miss Bigelow altogether. Hint: study the map and notice where all the high places are before heading out in the morning. 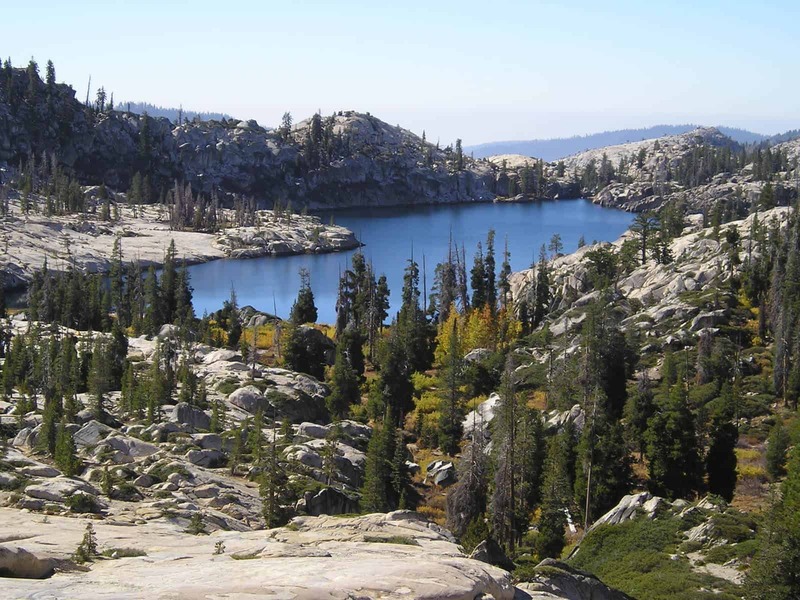 One difficult places to find in Emigrant Wilderness is Hyatt Lake. There are no trails into the Lake, and only a very experienced backpacker can nagivate the ducks, granite faces, and ridgelines to make it there. It is 12 difficult miles from Crabtree campground, a large part of it uphill. Still, the few who actually make to Hyatt Lake find the ordeal worthwhile. The views hiking over the ridge into the lake are spectacular (a huge granite bowl as far as the eye can see), sandy beaches, and high and low rock faces that are perfect for jumping into the lake. Swimming is a must-do activity. More than one local unit has organized hikes into Hyatt Lake for the weekend. Older boys carry gear and hike all the way into Hyatt on Day One and set up the camp. Younger Scouts stop at West Fork of Cherry Creek on Day One and continue into Hyatt on Day Two. Everyone hikes out on Day Three. About 24 miles round trip. A few years back, I was at Hyatt Lake, and as usual it was a great trip. That time we shared the lake with two groups. One a batch of skinny- dipping women who were obviously enjoying the water and the sun. The other group brought fireworks, which they set off at night over the granite bowl towards Big Lake. Totally illegal, but after we got over our worries that they might be emergency flares from stranded hikers, we enjoyed the flashes inter-mingled with the stars. Your turn. What are your favorite 50 milers in Emigrant? The photo posted above and labeled Hyatt Lake does not look like Hyatt to me – not enough smoothish granite aprons on either side. I do not recognize the lake but it looks like one I’d love to visit. Can anyone tell me which it is? Thanks! Hey, I’ve got sets of maps covering the East and West Flanks of the Sierra Crest across Emigrant Wilderness, continuing into the North Yosemite Backcountry, and then continuing South across the legendary “Five Canyons of the North Yosemite Backcountry,” (or hiking down to Hetch Hetchy!) covering both the Tahoe to Yosemite and Pacific Crest Trail routes. for a spectacular loop trip around the highest elevation trails in the Emigrant Wilderness. Those maps also link to the miles and elevations pages for the main routes. 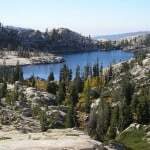 I believe Tahoe to Whitney has the best information for planning and executing excellent High Sierra backpacking trips along the Crest from Desolation Wilderness in the Tahoe Basin down to Donohue Pass on the South end of Yosemite. That’s because that’s as far South as I’ve completed the guide. I am always available through email for questions and consultations about any part of these trails covered on the guide. There are at lest two other routes into Hyatt…first, if you hike down the Cherry almost to the big granite bowl, on the left you will find a nice cross country route up the mountain and over….you can also access it from Rasasco Lake, which is also accessed from the Cherry, up what is known as the golden staircase. the routes can be found on older trail maps which include cross country routes….both are a bit tedious, but with a marvelous prize at trails end….the lake is always spectacular, with lovely white sand beaches, and incredible granite…it really is Yosemite level, but just over the mountain from the Kibbe Ridge….fortunately, it is very hard for horse to get in..so, it is pretty much left for backpackers and day hikers…. First get a Forest Service Map (Satnislaus) and go to the town of Long Barn, look for the last road leaving the backside of town back to the highway going to the east, 3N69 it is paved for a long time close to an hour then turn left on 3N16 (GRAVEL) north. The road (3N16) follows a stream on the eastern side of the valley, you will come to a fork 3N20Y to the left DONOT take it keep going straight until the road ends, actually blocked by felled trees small camp site over the logs to the right of the continueing road up camp there if you get there late at night. Start hiking up the road towards Bourland Meadow. You will notice on your map a soft way down to the west fork of Cherry Creek on your right, it might be marked or a trail by now if you get to Bourland Meadow you have gone to far although it is pretty. The trail should within the second small sqaure to the right of the end of the road on your map. Follow the trail down to the creek there will be some large pools and a camping place with a raised fire place. From this camp playing in the creek and fishing the pools is great laying on the granite at night (warm) and look at the stars is awesome. Down stream there is a 10 to 12 foot falls if you are curious. Then follow the stream up a little and you will notice a soft saddle at the ridge climb into the saddle across the sheets of granite and follow the trail north just below the ridge north to Hyatt. Once there the surrounding lakes to the north and north east are a stones throw away. You can make it longer farther or just a relaxing fishing trip as I plan to do hit around 65 or 6 lakes and just have fun. Fishing usually is great . Also if you take the 3N20Y fork you can follow it to the Chain Lakes Trail Head for a fun 3 day weekend, 3 miles in and warm water as the lakes are shallow but fun. You can fish but catching them there is difficult. There is another way into Hyatt shorter and easier and that is all I will say about that. I have been there many times, it is truely a fantastic place. I am going back in the early part t of this August for 10 days with a few Boy Scouts to introduce them to the Emigrant Wilderness Area. If you would like further info contact me. Robert, I agree with you. Fireworks and the Wilderness do not mix. Just to be clear. Our group did not have the fireworks. We did not know the people who had the them and we reported the incident to the Ranger when we got back. Thanks for the comment. Our Troop has done two 50 milers in the Emigrant Wilderness (2004 & 6). We’ve done loops originating at Crabtree Camp. 2004 route was Crabtree to Grouse Lake, Cherry Creek, Wood Lake, Buck Lake, Emigrant Lake, Middle Emigrant Lake, Emigrant Meadow Lake, Bond Pass, Snow Lake, Huckleberry Lake, Letora Lake, Gem Lake, and back to Crabtree. Highlights include fishing at Buck Lake, Emigrant Lake being partially frozen over on 4th of July (’06), the view at the pass between Snow Lake and Bigelow Lake (Some maps don’t show the trail here. It is sparse and requires some bushwacking! ), rock formations and swimming at Letora Lake (several shallow inlets mean relatively warm water! ), and excellent fishing at Bigelow Lake. Crabtree is a good trail head with a forest service campground, picnic tables and vault/pit toilets that don’t stink! Great place to organize yourselves and your gear, spend the night, acclimate for a bit and be ready for your first day on the trail.